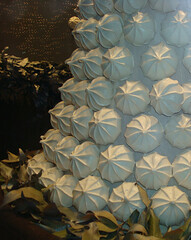 Meringues: light-as air confections; a marriage made in heaven with lemon pies. But on a deeper level (and at this point we pause to look the slightly-browned puff soulfully in the eye), who are you, little meringue? We had these questions on our mind when taking on our first Daring Bakers Challenge; so, we took some time to do some research on this sweet treat. Here's Cakespy's response to some Frequently Asked Questions about the mighty meringue and its relationship with that famous pie, as well as our offering to the Daring Baker's Challenge! Q: What is a meringue? A: Most simply put, it's a confection made from whipped egg whites and fine (caster) sugar. The way it helps us to think of it is, kind of like whipped cream, but instead of cream, egg whites (for what it's worth). Q: What is the difference between meringue cookies and meringue on top of a pie? A: There are different ways to make meringues. The "soft" meringue that you will see on top of pies has only a small amount of sugar to egg white; the "hard" meringues which may be bagged or sold in boxes, are crumbly but quite solid; this is a result of a higher sugar-to-egg white ratio. Q: Where does its funny name come from? A: Depends on who you ask. Some insist that it got its name from the Swiss town of Meiringen where some claim the confection was invented by a pastry chef in 1720. However, the word "meringue" appeared in a French cookbook from 1692; so, there is some debate over where the name really comes from. The Dictionary of etymology cites "unknown origin". Quel mysterieuse! 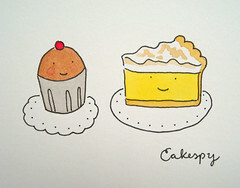 Q: Why do I never see Lemon pies without meringue? 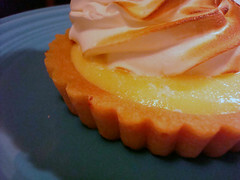 A: Good question, and while you may see a tarte citron, you'll rarely see a lemon pie sans meringue. Although we couldn't find a definitive answer, here's what we think: lemons are sour. Their taste alone doesn't really make a good sweet, so frequently they will have a sweet accompaniment; think of the lemon bar's shortbread crust, even that tarte citron's sweet pastry shell. Since the pie crust will frequently not be sweet, we think that perhaps the addition of the sugary meringue is to add a much-needed sweet complement to the sour lemony filling. A: Meringues are, on their own...very sweet. So, it depends on the taster. Marie-Antoinette, that queen of sugar she was, is said to have adored them; to the Cakespy crew, in general they're not entirely compelling all their lonesome. 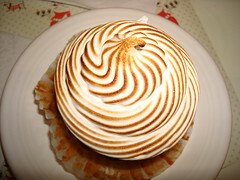 To us, the true goodness of the meringue is brought out by other flavors which accompany and complement that sweetness. 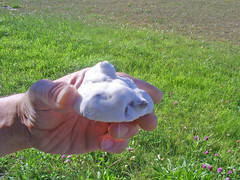 Q: What does it mean when a meringue "weeps"? 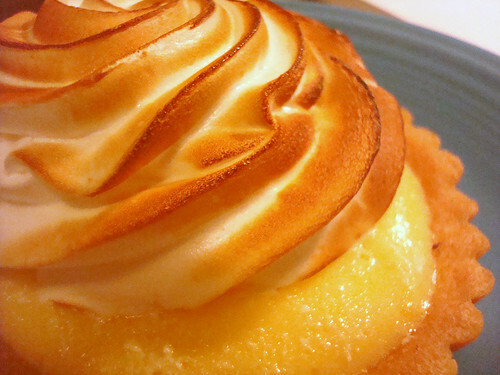 A: On a Lemon Meringue pie, a magical place exists where meringue ends and filling begins. Not so magical when a syrup forms in that layer and seeps out while you're cutting the pie in front of guests. Usually, this is because the filling is undercooked on the bottom, and moisture is held suspended. How do you keep your meringue from weeping? Act quickly upon taking your pie from the oven: meringues should always be set on piping hot pie filling to adhere properly. More suggestions can be found here. Q: What is a marshmallow meringue? A: A marshmallow meringue is pretty much a meringue, but with marshmallow cream added (think fluff), and is a wonderful accompaniment to sweet potato pie or sweet potato cupcakes (photo left, Marshmallow meringue topped cupcake from Trophy Cupcakes). We like this recipe for its tiny addition of salt, which seems to make the taste come alive. Q: Is Divinity a meringue? A: While they are similar, we'd say that they're more like cousins than immediate relatives; the ingredients and methods differ. While meringues consist of egg whites and super-fine sugar, divinity calls for a mixture of white sugar, corn syrup and vanilla; also, the method of making divinity is more consistent with candymaking techniques, calling for a syrup to be made and heated before the beaten egg whites are added. For a recipe, check out this link. Q: Can you teach me to meringue like in Dirty Dancing? A: Silly rabbit, you're mistaking the meringue with the merengue, which is a type of Latin dance. While doing the merengue is an excellent way to work up an appetite for meringues, they are completely different things. Interested in finding out more? We found the following resources very helpful: whatscookingamerica.net and joyofbaking.com. And as for the Daring Bakers Challenge? Well, we cheated a little bit to go for the extra tartlet challenge (we got some help from a talented baker who *ahem* does it for a living--wouldn't have looked like this if made by Mrs. Cakespy alone), but ours did come out quite nicely, guess it makes a difference when you have all those tools and gadgets of a commercial kitchen. It was really fun--Head Spy Jessie had never "done" meringues before, so it was a very interesting experience. Oh, the power that a mini torch makes you feel in the kitchen.